Editor’s Note: On November 12, at the Provincialate in Des Plaines, IL, Sr. Marie Kielanowicz shared this homily with sisters during morning Mass. 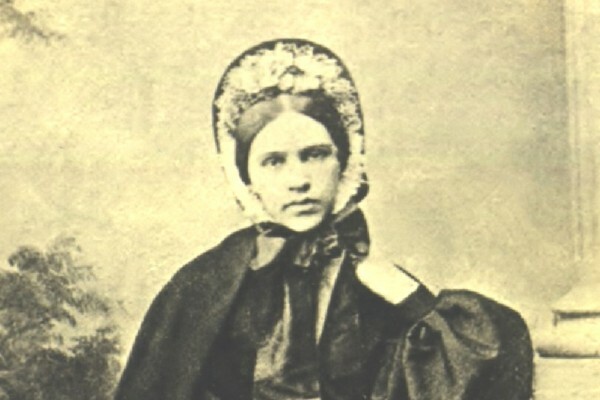 It was a stormy afternoon in Roszkowa Wola, a village in Russian dominated Poland when Adolph Siedliski and Cecilia Morawska welcomed their sickly daughter, Frances Anna Josephine, into the world at 1:30 p.m. on November 12, 1842. They cradled their newborn with a mixture of joy and trepidation because the child was so weak that the doctors had little hope for her survival. Eight days later, on November 20th, Adolph brought his infant daughter to the Church of St. Anthony in Warsaw where she was baptized at 3:00 p.m. – on the eve of the feast of the Presentation of Mary. In the mysterious designs of Divine Providence, 60 years later, she breathed her last at the same hour on that same feast in 1902, her life ‘book-ended’, as it were, by this Marian celebration. So it is appropriate that we celebrate her birthday and feast day together this morning. This remembrance of Mother Mary’s birth and the anticipation of her feast set me to thinking about the significance of one life and of how deeply those who have gone before us influence our own becoming. We have so much to be grateful to her for because her life and witness have been a significant shaper of who we have each become. Ancestors, even spiritual ancestors like Mother Foundress, are responsible for creating the environment in which we develop and grow, the traditions and customs that have been passed on to us which we still observe today, the culture, lifestyles, values, ideas, and thought patterns which have an impact on our personal identities. I think we would all agree that, after all these years, Mother Mary is still an unwavering, silent but living presence deeply entwined in our own lives. We celebrate the beauty of her spirit, and our shared legacy of grace as her spiritual daughters; we yearn to learn from her wisdom, and responsiveness to the sacred whispering to us in the depths of our spirits. Mother Foundress stands at the beginning of our Nazareth spiritual genealogy, and her influence is embodied in thousands of other Sisters of the Holy Family of Nazareth who have also had a unique and lasting impact on our lives. Through their fidelity to Mother Foundress’ original inspiration, down through the generations, we each bear that distinctive spiritual imprint on our souls. We thank and praise God for them. But now, our lives have become the latest chapter in the story of Nazareth community and the responsibility to tend the fire is ours. Commenting on the Gospel parable of the Five Wise Virgins, the noted Scripture scholar, William Barclay, reminds us that none of us can live on ‘borrowed fidelity’; one cannot borrow a relationship with God, we must possess it for ourselves. We cannot live on the spiritual capital of others; instead we must each carry our own oil, we must each do the inner work of readying ourselves to greet the bridegroom when He comes in the unexpected moments of our daily lives. We hold the fire now - every one of us sitting in this chapel today and in our Nazareth chapels throughout the world. This celebration, then, is not just a happy remembrance of the past. It is also a challenge. So, today, as we mark this dual celebration of Mother Foundress’ birthday and feast day, let us not only thank God for the gift of her life and that of so many Sisters who have kept her vision burning. Let us also ask ourselves the challenging questions: How am I a living link, a spark in the rich and profoundly beautiful tradition which Mother Foundress and all our spiritual ancestors have passed on to us? How do I carry the vision for today and tomorrow? What does my life mean for others? Are they, will they be able to stand on the strong shoulders of my faith? From the Diary of Sister Valeria who knew Mother Foundress; many people from Zdzary, some of whom were present when she was born, also confirm this.